The merging of the pioneering medical and tech industries has created a wealth of opportunities, which is something the inaugural Med Tech Investment Showcase explored yesterday (2 March) in London. Taking these innovations to the next level by securing funding is a fundamental requirement for success. This is the aim of Wessex Academic Health Science Network (AHSN) and SETsquared, who have joined forces along with the AHSNs from across the south, to help entrepreneurs change lives for the better by holding this showcase event. 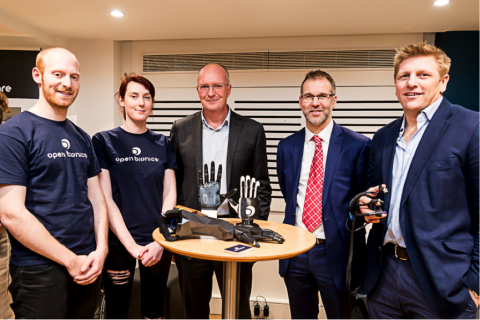 The businesses pitched to 100 angel, venture capital and corporate investors at the showcase led by Wessex AHSN, with global leading university incubator SETsquared. Daniel Jones, of online investment platform SyndicateRoom, said: “The start-up companies I saw exhibiting and pitching were very innovative. The technologies have a huge range of applications outside of the med tech sector as well, and are addressing large markets – which makes them very interesting.“It’s also such a great opportunity for these companies to pitch to such a wide variety of investors.”The investors were specifically looking for products and services that can save the NHS money while also offering a broad commercial appeal – with excellent prospects to make a financial return. The showcase was also supported by AHSNs from the West of England, Kent Surrey and Sussex, and the South West.